Owen Miller toddles around during a recent ceremony when his parents, Melissa and Mike Miller, donated a cuddle cot to OhioHealth Grady Memorial Hospital. Cuddle cots cool the bodies of deceased infants, allowing families to spend time with them. Owen’s twin, Henry, passed away in March 2016. The cuddle cot that Melissa and Mike Miller donated to OhioHealth Grady Memorial Hospital includes a plaque noting that it is dedicated to the memory of Henry Miller, the Miller’s son who passed away in 2016. Such joy, such a blessing for families. Those were certainly the thoughts surrounding the Miller family of Delaware County in March, 2016. At 36 weeks, around 11 a.m. on that day, Melissa experienced what she thought was the start of a migraine headache. After a couple of calls to her physician, she was on her way to the hospital. “I would not panic, because I didn’t want my babies to panic,” Melissa said. Around 1 p.m., in a triage room at St. Ann’s Hospital, a nurse placed heartbeat monitors around Miller’s stomach. One baby’s heartbeat was found, as the nurse moved the monitor down to find the second heartbeat. Soon after, the nurse left and came back with an ultrasound machine. The image of the babies appeared on the screen. “We heard the words no parent should ever have to hear. I’m sorry, but there is no heartbeat.” Miller said. Four hours later, Henry Donald Miller was delivered silently, two minutes before his little brother Owen. Wanting to spend time with Henry, the Millers learned that St. Ann’s had a Cuddle Cot, a device the manufacturer says cools the baby, allowing families to stay with their baby in the room. The Miller family says they were so grateful to have the Cuddle Cot donated by another family who lost a child, they wanted to do the same for Grady Memorial Hospital in Delaware. 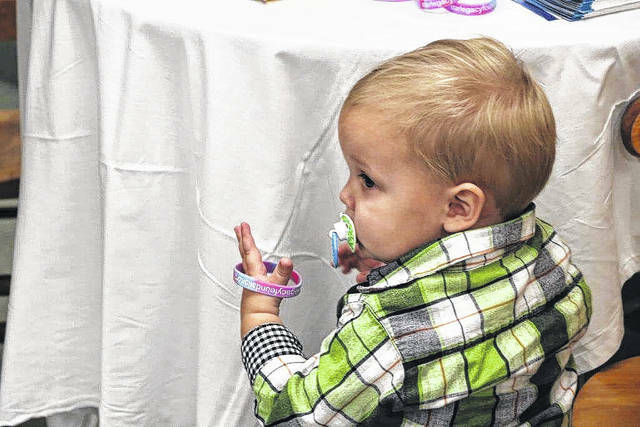 Owen, Henry’s twin, walked around during the ceremony at Grady Memorial full of life, something statistics say won’t happen for 71 families each day. In 1984, President Ronald Reagan declared October as National Pregnancy and Infant Loss Awareness Month. “Our hearts will always grieve and miss our precious boy. But we are proud that his name is known in our community. Please pray for all the families that will use this Cuddle Cot. We will always think of them with our Henry,” Melissa said.